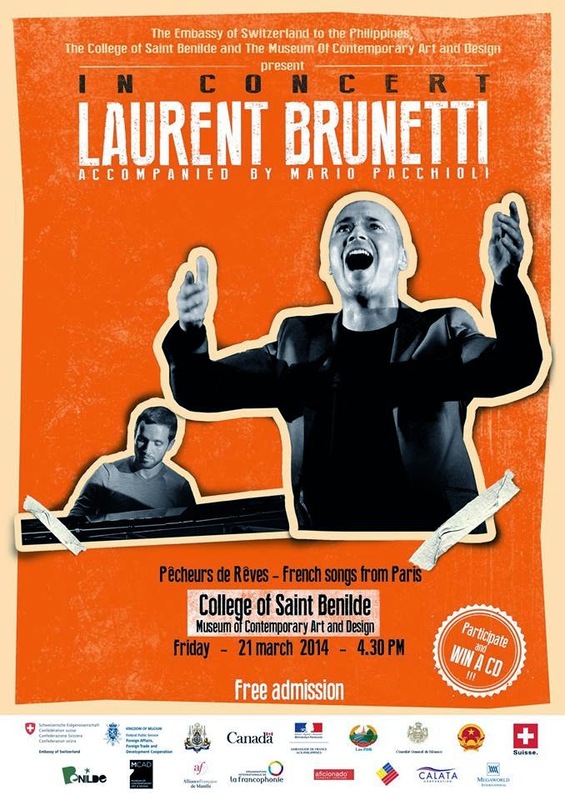 Everyone is invited to a performance featuring Laurent Brunetti, with Mario Pacchioli on the piano, on March 21, 2014 (Friday) at 4:30pm. This will be held at the Museum of Contemporary Art And Design of De La Salle-College of St. Benilde in Manila. Admission is Free. Laurent Brunetti is known for his great renditions of famous French chansons, but also for writing and interpreting his original works. Born in Switzerland, he now lives in Paris. He finds his artistic inspiration in people's lives, and his lyrics are the reflections of their stories. Mario Pacchioli is a composer, arranger and pianist. In 2004, he received a Gold Award for his work and his talent.